The BLS reported today that Owners Equivalent Rent, a fictitious input to the CPI which, with the similarly formulated lesser item rent of primary residence accounts for nearly 32% of the total weight in the index, rose by 3% between July 2014 and July 2015, including a seasonally adjusted, fictitious +0.3% month to month in June. The BLS has used these tortured calculations since 1982 to suppress the housing component of CPI. Prior to 1982 the BLS had included house prices, but because the actual purpose of CPI is for indexing government benefits, including housing inflation at its actual rate became too costly. The BLS therefore eliminated it from consideration in the second year of the Reagan administration. Since then, they have used the fictitious construct of Owner’s Equivalent Rent. From time to time the BLS asks owners what they think their house should rent for. They adjust that fantasy number every month by the actual amount of rent that tenants pay according to surveys of tenants. In the business, this is known as contract rent. The problem with that is that leases are typically indexed to CPI, or capped at 2-3% per year increases. Tenants who have been in their apartments for years see their rents going up 2-3% and that’s what they report. So this component of CPI magically looks like CPI most of the time, except when the gap because so large that landlords begin to push harder for bigger increases in long term leases. This lag factor eventually causes OER to play catch up to reality, but it never catches up completely. Since 2000, OER has risen at a compound annual growth rate of +2.5%. Meanwhile, market rent, which is the actual price paid by tenants in the marketplace, and is the true state of price level inflation, has been rising much faster. Over the past 15 years rents have risen at a compound annual growth rate of +3.7%. However, the actual price of rent in the market is not considered. And the actual rate of house price inflation is not considered. If our aim is to measure inflation, shouldn’t we be measuring actual prices in the market place, rather than people’s imaginary opinions, and fixed rates of increase established by contracts written years ago? What does a lease signed in 2008 have to do with current conditions? Using OER instead of market rent or actual house prices, to measure “inflation” is fraud, plain and simple. We know from a variety of surveys that house price inflation has recently been running around an annual rate of 5-6%. Rents have been rising at a similar rate. The census bureau surveys rents quarterly. Their second quarter survey showed median rents increasing by 6% nationally, year to year. Zillow, an online real estate listing service showed asking rents for single family houses and condos listed for rents rising by 10% year over year in June. This is a narrow sample of a particular type of property and not representative of the national rental market as a whole, which is dominated by multifamily housing. Axiometrics, a research service serving rental housing investors, surveys of hundreds of thousands of rental units across the US each month. It reported that rents rose 5.2% on average nationally, year to year in July. Significantly, the firm also reported that this was the sixth consecutive month of rent growth exceeding 5%. This is not a flash in the pan. But the BLS reports that the housing component of CPI rose by just 3% year over year and 0.3% month to month. This is a 40% understatement of the actual rate. The net difference in the monthly seasonally adjusted rate is approximately 0.2%. With the housing component of CPI accounting for 40% of core CPI, a quick and dirty calculation indicates that the understatement of rents has cut the monthly core CPI growth rate by just under 0.1%. This would have resulted in a headline print of +0.2% for July core CPI, which, annualized, is above the Fed’s target. But i’s actually worse than that. The BLS reported that the year to year increase in core CPI was +1.8%. With rent increases included at +3% against actual increases of +6%, the understatement of rent increases for the past year has been 50%, or a net of 3%. At 40% of the total core CPI, had rents been measured properly, they would have added another 1.2% to the current print of 1.8%. That would mean that if calculated properly, core CPI should be +3.0% year to year, which is just about where Core Finished Consumer Goods PPI said it should be. The Fed started stating an explicit inflation target in 2012. In spite of rent growth falling below OER for 9 months in late 2012 and early 2013, OER has persistently understated rent growth. 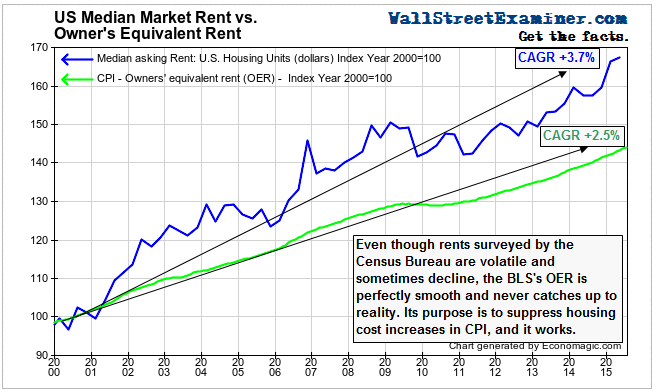 Since the Fed began targeting inflation in 2012, rents have risen at the compound annual growth rate of +3.9%. OER has only risen at a rate of +2.6%. 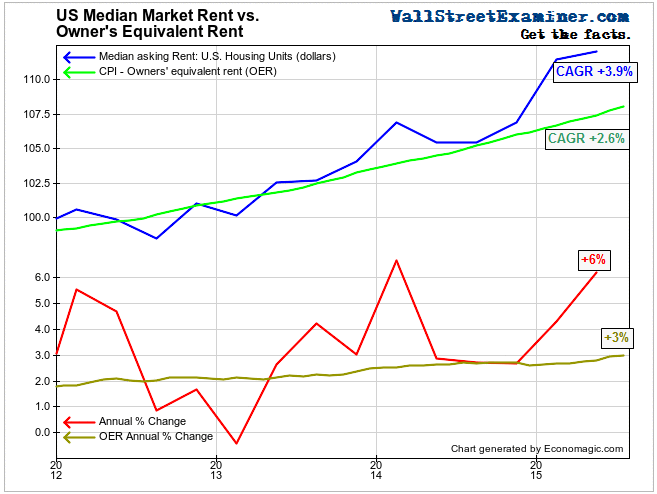 Over the 3 year period OER has understated rent inflation by a third. And instead of correcting, the gap is worsening. At present OER is understating rent inflation by 50% at 3% instead of the actual 6%. Making matters worse, the Fed’s favored inflation gauge of core PCE suppresses the housing input even more than CPI does. The data shows again that by focusing on bad data, the Fed continues in its delusion that inflation is below target. The fraud is instigated by the BLS, aided and abetted by Big Media press release repeaters, and everybody on Wall Street pretends to believe it. The post Here’s Proof That Core CPI Is Really +3%, Not +1.8% appeared first on The Wall Street Examiner. Follow the money! See and understand the liquidity flowing from the Fed, Treasury, and other major central banks and primary dealers as they impact markets in the Wall Street Examiner Professional Edition.